I’ve thought a lot about where to start with this first Chartered Trip. Do I go chronologically or do I choose some other sort point? But as I worked on the piece you’re about to read it became clear that this was the place to begin. With a band I knew, and a record I dearly love: The Glad Version, ‘Smile Pretty Make Nice’. I hereby contend that they’re talking about ‘Smile Pretty Make Nice’. And that’s because when we all first met Adam he was presiding over this glorious, noisy record. If you haven’t heard it, or haven’t heard it lately, I strongly recommend that you take the time to put it on your favorite listening device, sit down, and listen. It’s more than worth it. And gliding beautifully over all that wonderful din was Adam’s clear tenor. It’s a heady mix. I count Adam as a friend and collaborator. While I feel confident that I can assess his musical output through an objective lens, when it comes to the man himself I am unashamedly subjective. He’s a pal. This record is by no means the last time Adam rocked. His catalog is littered with great rock tunes. How this group of songs differs from what would follow is hopefully among the things I’ll illuminate as we go along. For this Trip, I’m thrilled to say I have the advantage of also getting the story from the lads themselves. Adam, Chris Salter and Shawn Neary were all kind enough to share their memories and reflections about making this record and what led up to its creation, so at times I’ll be quoting them. And we’ve added a third segment to this Trip devoted to the interview in its entirety, because honestly it’s as fun as the rest all on its own. So buckle up, and let’s get going. When Adam Svec showed up at my day job in 2003, I was pretty sure he’d sized me up and not liked what he saw. Which was a shame, because I could tell immediately that he was someone I wanted to get to know. Luckily, my apprehension was unfounded and after a while we started to chat about our various musical endeavors, which chatter led eventually to him inviting me onto a bill for a show with his band, Boy With Stick. Despite the fact that the gig was maybe nine days away and I hadn’t even contemplated how I would do a solo show let alone tried it, I immediately accepted – it just seemed like a bad idea to turn down any opportunity, and if they were nice enough to give me a shot I was damn well going to take it. I managed to pull a set together and practiced about six hours a day for the following week, and the night of the gig I showed up with a 50-watt head and 2X12 speaker cabinet in tow along with my acoustic and a few pedals. The sound guy wasn’t thrilled with my amp and I was a bit worried I’d already botched the operation, but we came to an understanding and Adam and the guys seemed amused, at worst. I got through my set and every single member of Boy With Stick made it a point to come up to me and compliment it. And damn if they didn’t seem really pretty sincere about it, too. Then they went up on stage and just crushed the joint. Nice guys, and much, much better at this thing than I was. As it turns out, that was not long before the band would change significantly. 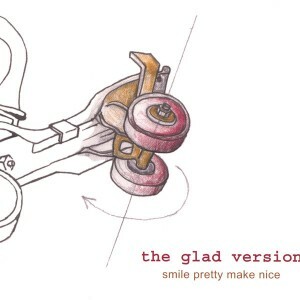 Prior to Smile Pretty Make Nice being released, they would change the name of the band to The Glad Version. And shortly after the release, bass player Shawn Neary and drummer Michael McGregor would both leave the band to pursue different opportunities. Truly, the band that made this record was markedly different than the band that would go on to record Lights Out North Star and Make Islands. Perhaps the easiest way I can illustrate that is to mention that of the 10 songs on the record, only two (Life Of It and Sand) were written by Adam. As I stand here in 2013 with the benefit of five records full of Adam’s songwriting at my disposal, that’s kind of a mind-blower. Not only that, but Sand is also the only one he played guitar on. I mean, if there’s one thing he and I have discussed more than songwriting it’s guitar playing and guitar gear. Crazy stuff. This is in no way to disparage the work of Shawn and Chris, who wrote the rest of the record – I mean, it’s one of my favorite records and I’m writing about it, so obviously I’m a big fan of what they did. What I’m trying to say is that this is a product of a unique combination of talent that was about to stop combining in this particular way, and an era that was coming to an end. These guys got together in Iowa as college students, and this really was the culmination of that original lineup. Which would be pretty sad if we didn’t know that Shawn would go on to be part of Tapes ‘n Tapes and Cloud Cult (not to mention founding The Wapsipinicon) and Adam and Chris would continue to make fantastic records – two more as The Glad Version and another three (and counting, if life is at all fair) under Adam’s regular old name. And really, that’s why we won’t ever get that thing we all quietly wish for in this case. It’s not that Adam hasn’t rocked since then, it’s that what we’re wishing for is a much more complicated thing that’s related to the folks involved, the time it happened, and the events that occurred at that time. It’s a pretty piece of amber that nobody can ever recreate. But we can sure as hell listen to it. That’s the beauty of recorded music, really – we can pop this on our sound source of choice and go right back to that moment. The accompanying interview with Adam, Shawn and Chris should give you a fantastic view of the band’s history and the making of the record, so I’ll end this section with one last thought about how they relate to my own history. First, they were the first act I met in the Twin Cities who just offered me a spot on one of their bills. No questions about whether I knew anyone, just hey do you want a spot on this bill? And they along with another band, Cathode Rae, were the first to treat me as another musician rather than some guy from Illinois who seemed a bit old to be trying to do this whole music thing. Put more succinctly, they were kind. That means something in my book. And they haven’t grown out of it in any way. When I was at a dead end with the final song for my band’s second EP, Adam strolled in and not only saved the song but made it far better than it had been. Then he happily submitted to being filmed for the video of the song, and even put some time into talking it up around town and on the internets. So, yeah. I’m a fan. Here’s the deal: You all go get your copy (or if you don’t have it, buy it already), give it a good few spins, and we’ll all meet up here next Wednesday and talk about it. Deal. And since it’s a three-parter, we’re going to add a bonus entry on Friday devoted solely to the interview. See you then!